The CT-AV-EXT is an audio/ video balun kit consisting of two interchangeable units (a transmitter and receiver) that boosts video/audio transmission distance up to 1000 feet. VP-737 is a composite video signal repeater which consists of a transmission and receiver unit. Composite + Audio Input Decora Plate for VSA System. 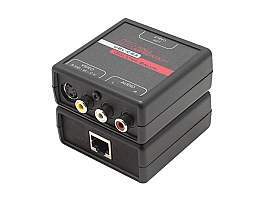 Sends composite video and stereo audio up to 1200 ft over a single Cat5 cable to a VSA System Receiver. Power is supplied by the system receiver. The IVB-203P video balun is passive (non-amplified) device that allows the transmission of real-time CCTV video signal via cost-effective Unshielded Twisted Paired (UTP) cable. baseband (composite) signals of any type are supported. Composite and S-Video extenders allow Composite/S-Video signals to travel very long distances. Although Composite and S-Video may soon be overtaken by digital interfaces such as DVI or HDMI, they are still the most widely used analog video interface for standard definition video quality at 480i or 576i. These extenders are very common in game centers, training facilities, control rooms, home theaters and other commercial applications. You may be wondering what the difference is between Composite and S-Video. Composite and S-Video use very similar technologies; however composite uses one wire pair versus S-Video using two wire pairs. The two interfaces differ in their level of encoding. With more encoding comes degradation; composite has the most amount of encoding while S-Video is less. Typically, Composite and S-Video use two types of connectors which are RCA and BNC. A typical cable may run about 100ft. until degradation sets in. Longer cable runs will require the use of an extender. Common Composite/S-Video extenders use a category cable to connect the sender and receiver for flawless video extension of up to 1000 feet. For extreme distances, fiber optic senders and receivers can extend a Composite/S-Video signal up to 30 km or 18.75 miles over fiber optic cabling. Applications including large facilities, airports, building to building and stadiums are best suited for fiber optic extenders. We stock the most dependable and cost effective Composite/S-Video extenders from industry leaders including Kramer, Gefen, TVOne, Hall Research, Atlona, Shinybow, Muxlab and many more. Our qualified representatives are standing by to take your call for any questions or concerns regarding these extenders or your application.